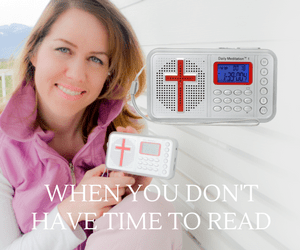 Home Messianic Remnant Does Hanukkah Give Us A Detailed Look At The End Times? Jonathan opens up how Hanukkah contains some of the most amazingly detailed revelations of the end times. In recent years, many people have made the connection between the appointed festivals in Leviticus 23 and later events in history. For example, Feast of Tabernackles is widely known to be a foreshadow of the Messiahs birth. Passover foreshadowed Yeshua Jesus as the final lamb sacrificed for the world’s sins. First Fruits happened to be the exact day of Yeshua’s resurrection. Feast of Trumpets is celebrated as the day Yeshua will gather his elect to the great supper in heaven, and several days later will return with his people on Atonement, where the battle of Armageddon takes place. Pentecost happens to be when the law was given, and later on the exact same date, the Holy Spirit was poured out. Even though Hanukkah doesn’t appear in Leviticus 23, we do know that Yeshua Jesus celebrated this festival. At this time anyone who practiced Judaism was a target under this new regime. It was also decreed that Torah (the Law of God) could not be studied under penalty of death; also Jewish males were not to be circumcised and it was forbidden to keep the Sabbath. 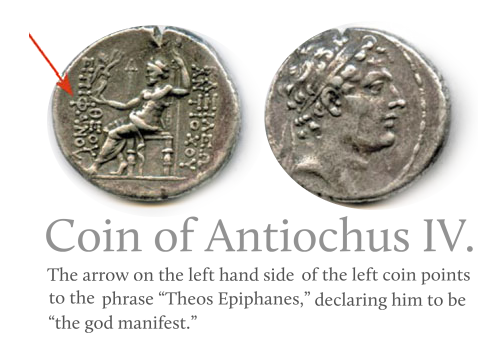 During this new regency, Antiochus sent troops from village to village with a statue of himself, ordering people to bow down to it. While there were many believers who submitted to this new authority, there was a select few who didn’t bow their knee to this false god. The tipping point came when Antiochus’s troops arrived in the village of Modi’im. An elderly man stepped forward to comply with the order, but a priest who would not submit, Mattathias of the Hasmonean family, thrust a spear through the elderly man, killing one of the Seleucid soldiers. This event began the Maccabean revolt. Mattathias, along with five sons and others fled into the Gophna Hills and conducted a war against the Seleucids for three years. In the DVD “The Hanukkah Endtime Mystery”, Jonathan Cahn shows graphic drawings of these wars, giving you a picture in your mind how this war might have taken place. War after war, this remnant group of believers were out numbered in every way, but overcame by the Power of Yahweh. 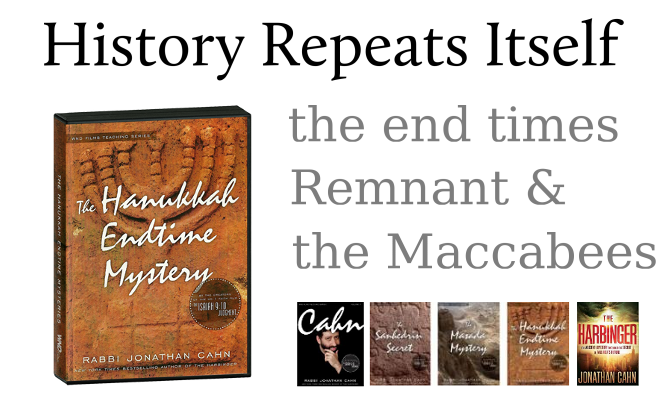 Jonathan Cahn, paints a picture for us, showing the connections between the Maccabean revolt and the startling parallels of what we are told faces the end times believers. Most people don’t know the history behind Hanukkah, other than lighting the manorah during this eight-day celebration, but it appears like the other holidays we celebrate in Leviticus, that this holiday too, gives us a clear picture of something to be full filled in the future. The shocking history of the Maccabees shows a small group of passionate believers in Yahweh who would would not toss aside their faith to conform to the degenerating society around them, and a tyrant who presents himself as god. The Antichrist is most often referred to another tyrant in the last days. According to the bible this person will be history’s last and most terrible dictator. During his rise to power, he will present himself as a man of peace. His sweet-sounding words of peace will not match his terrible acts of war. He will present himself as a lamb, but he will really be a wolf in sheep’s clothing. Apostle Paul described these last days as “perilous times” (2 Timothy 3:1). Wars and rumors of wars, economic disasters, starvation and sickness will be predominant. Who are the Remnant believers in Revelation? The book of Revelation speaks of the end times and the true people of God, a group of people called the “Remnant” which Satan will make war against. A remnant has been said to be the small piece of something left over from the original. It is identical to the original, but in smaller proportion. When the Bible speaks of the remnant Church, it is referring to a small proportion of God’s people at the end of time who have clung to the unadulterated belief system, identical to the faith and doctrines of the early Christian Church. This Remnant will be comprised of people who have not have allowed pagan practices introduced into their belief system as it has unbeknown to many Churches. What Does The Bible Tell Us About The Early Church? 1. It shows that they were a Holy Spirit driven people. They were on fire for God. Many miraculous healings were done as a sign that these people were empowered by the true God seen in Acts 4:13. This early Church believed in the Father, Son and Holy Spirit which the Bible calls the Godhead but is called the trinity by many. 3. They broke bread together. They were also generous stewards, making sure that no one in their midst was left in need. They worked as a team, caring for one another and went forward with one accord. 4. Many wonders and signs were shown through them. 5. They had a strong praise and worship towards God continually. 6. They had a strong prayer fife.